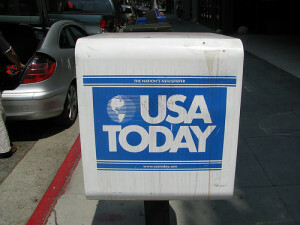 USA Today, the country’s second largest newspaper, recently announced plans to restructure itself “from a newspaper company to a multi-platform media company.” The move comes in response to decreased circulation — down to 1.83 million from a 2007 high of 2.3 million — and nearly 50% less advertising compared to 2006. The paper’s owner, Gannet Co., has seen plunging stock prices in the past four years, with a 78% drop. The paper’s main sections — News, Sports, Money, and Life — no longer have separate managing editors. Instead, ‘content rings’ will be led by editors who will be appointed later in the year. The content rings will be labeled Your Life, Travel, Breaking News, Investigative, National, Washington/Economy, World, Environment/Science, Aviation, Personal Finance, Autos, Entertainment, and Tech. In addition, the Sports section has been spun off into its own brand: USA Today Sports. When USA Today was first launched in 1982, it received both criticism and praise for the way it whittled down news stories into an easy-to-read format. Articles were shorter than standard newspapers, and were accompanied by colorful graphics and photographs — all elements that were unique for the time but have since become more commonplace. Adam Hochberg of Poynter Online writes, “For many former readers, newspapers have become so passé that it’s become hard even to give them away.” Gannet had distribution agreements with many hotel chains that made USA Today available to guests each weekday morning. Fewer guests have been actually reading the paper, however, as hotel rooms become equipped with Internet access, and the guests use their mobile devices which don’t require an Internet connection. Gannett Blog, a site critical of Gannett and not affiliated with the company, has provided via Google Docs the slideshow that USA Today presented to its employees.